Describe the functioning components of horizontal sliding fire door assemblies and explain the practical safety benefits as compared to traditional vertical rolling door systems. 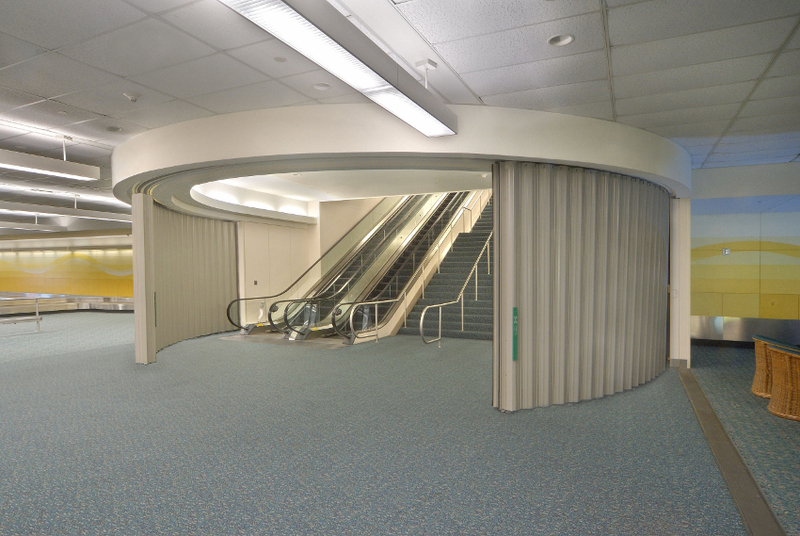 Assess the design implications of specifying sliding fire doors in commercial buildings. Identify the building and fire codes that regulate sliding fire doors, particularly egress requirements found in IBC and NFPA. 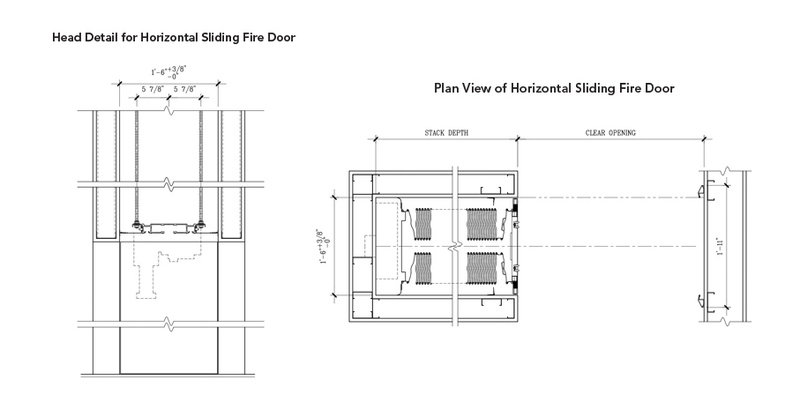 Discuss the typical features of a horizontal sliding fire door system that contribute to both design flexibility and practical means of egress. The ability to curve horizontal sliding fire doors provides the architect with endless design possibilities. 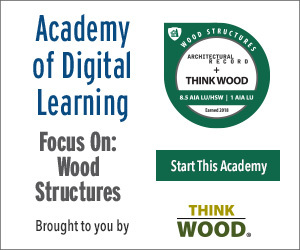 Yet many design professionals remain unaware of these code changes and the significant architectural possibilities resulting from their across-the-board code acceptance—and the implications of incorporating sliding door systems early in the design stages. Sliding door systems play an increasingly key design role where there is a need to have openings that exceed the 4 or 8 feet provided by conventional fire-rated single- or double-swing doors. Moreover, free from the limitations of rectilinear footprints, architects are now able to design fire-rated extended spans and curved openings for an almost endless number of applications. There are many application examples in the United States and abroad. Installed in a multitude of building types, they are found in schools, churches, high-rise office buildings, casinos, airports, senior living facilities, health-care facilities, shopping malls, hotels, public transit, and museums—often at lower costs than for other solutions. With an increased focus on building security since 9/11, government offices, embassies, schools, and courthouses are also increasingly turning to sliding door systems as protection in emergency situations. From the Venetian Macao, the $2.4-billion anchor luxury hotel on the Cotai strip in Macao, China, to Frank O. Gehry’s Guggenheim museum in Bilbao, Spain, sliding door systems also offer an innovative solution to the code constraints of creating iconic and unique architecture. Sliding door systems provide an eminently practical means for quickly moving people through an unobstructed exiting system of a building. Repeated testing for use by occupants with disabilities and in wheelchairs has demonstrated that the sliding door system is far more effective when evacuating people from a building than a side-hinged or swing door. Swing doors clearly present user problems in building emergency situations, both for people in wheelchairs and on foot, particularly in crowded situations and when fire and rescue personnel are coming through the door from the opposite direction. Manufacturers have researched and developed sensors and precision microprocessor technology that opens and closes the sliding door with ease. In an emergency, a person with disabilities or in a wheelchair touches the fire exit hardware; the door opens to a preset width, allowing the person to egress, and then recloses, protecting the opening. “The fire-rated horizontal sliding door is the best way to move people through fire barriers during any type of building emergency—whether or not they have a disability,” says Edwina Juillet, co-founder, National Task Force on Fire and Life Safety for People with Disabilities. Horizontal fire-rated accordion-type sliding doors are custom-designed to be stored in shallow recessed pockets in walls. Monitored and controlled by electronic systems, they self-close in the event of fire. In addition to there being no restrictions on the width of the size of openings in UL listings, sliding door systems can reach a 2008 UL-approved maximum height of 28 feet (taller applications, however, can be considered on a case-by-case basis). Moreover, because no floor track is required, they may be specified for radial configurations. With track detail recessed above the ceiling and accordion doors that fold to just inches per foot behind a pocket door, they are virtually invisible until activated. Sliding fire door systems are not applicable in openings designed for doors that are normally closed. A typical horizontal sliding door system employs a two-track system. Door panels are manufactured from 24-gauge steel and weigh 51/2 pounds per square foot. Panels are 41/2 inches wide, corrugated for strength. Between the two tracks is a 6-inch to 8-inch dead air space. The door assembly suspension and driver systems are independent. Panels are suspended from an overhead track with a steel pin and roller assembly to increase durability and to make maintenance easier. The door can be completely repaired in place because individual panels may be removed and replaced. The sliding door system is designed to remain in the open position. Upon a signal from the building fire alarm panel, smoke alarm, fire alarm, a manual pull station, or, in some instances, the activation of a sprinkler flow valve, the door will automatically close. Opening and closing speeds are regulated by National Fire Protection Association (NFPA 80, Chapter 9) Code, which requires speed of not less than 6 inches per second and not to exceed 24 inches per second. The typical rate of opening and closing is between 8 and 9 inches per second. At this rate of speed, a clear opening width of 80 to 90 inches can be created in 10 seconds. The door assembly’s sophisticated electronic control system operates on a 120-volt AC system that includes a backup battery system and microprocessors that continuously monitor the door systems. The 120-volt line is connected to a junction box in the storage pocket near the control box and continuously charges the battery. Upon activation, a high-decibel sound indicates that the system is in fire mode, and the door closes. If the leading edge of the door, equipped with a special sensor, encounters an obstruction, it will stop, pause momentarily, and then continue closing. Only light pressure on the leading edge is required to cause the door to stop. When in the closed position, it can be reopened easily from either side. Only 3 to 5 pounds of pressure on the exiting hardware cause the door to retract a certain preset distance (typically 36 inches), pause, and recycle to the closed position. The retractable distance was originally designed in conjunction with California Department of Rehabilitation engineers who were studying methods for evacuating persons with disabilities from multistory buildings during fire emergencies. Most manufacturers set the force to open at 5 pounds or less to comply with Americans with Disabilities Act (ADA) requirements for fire doors in egress applications. The distance the door retracts can be adjusted in the field. Resetting the door assembly can be accomplished by pushing the open/close rocker switch on the leading edge of the door to the close position. When not in fire mode, this control can also be used to position the door as desired. The typical sliding door system is designed, UL-listed, and installed so that it does not close upon power loss in the building, unless the loss of power is for a sufficiently long period of time that the voltage in the battery falls to around 11 volts. In typical openings, the door is capable of completing well over 50 complete opening and closing cycles on battery power alone. The door is also designed to be operated manually. Without a fire-rated sliding door system protecting the exit in this school, the corridor would require a wall and swinging doors, which could cause congestion in an emergency. Because the door’s drive system is structurally independent of the door’s suspension system, any force applied to the door’s surfaces will not obstruct the functioning of the door. Nor will any likely substantial deflection of the door have more than a minimal effect on the door’s opening or closing. Logic circuitry in the control unit prevents the door from opening when heat sensors detect a high temperature or fire condition on either side of the door.